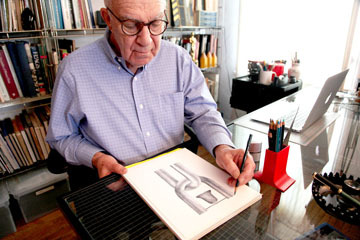 DRAWING A SKETCH for his Korean peace memorial is Arnold Schwartzman. Arnold Schwartzman incorporated shrapnel from the Demilitarized Zone for his 20-foot-high monument, “Peace Bell Memorial,” unveiled Dec. 20 at the Korean War Memorial Museum in Seoul. His more recent work is suspended from two links of a chain forming the letters “UN.” The monument is made of aluminum and bronze and stands on a circular stone base straddling the United Nations crest, surrounded by flags of member nations. The work was inspired by the Bible quote, “… to beat swords into ploughshares and spears into pruning hooks…” the artist says. Schwartzman was invited to make the piece for the Korean Informational Association after a documentary on his career was broadcast on Korean national television earlier in the year. A British native, he graduated from Canterbury College and served a year in South Korea with the British Army’s 1st Battalion, The Royal Sussex Regiment. A graphic designer, he was asked to make a temporary memorial to commemorate the Gloucestershire Regiment—who served in the Korean War in 1951. His first documentary “The Morning Calm,” shot on a camera purchased at the U.S. Army store in Seoul, is a chronicle of postwar Korea and is in the collection of the Imperial War Museum, London. He was appointed an officer of the order of the British Empire by Her Majesty Queen Elizabeth II in 2001, and in 2006 he was given the distinction of Royal Designer by Britian’s Royal Society of Arts.